Welcome to ‘Towersey Fringe 2019’ Where we hope you will Dance All Day and Laugh All Night! Can you believe it?! This is the fifth Towersey Fringe event and we thank you all for supporting us. As you may know by now, our aim is to provide a fun and inexpensive day out for all the family, rounded off by professional comedians, (hopefully) sending us all home laughing, whilst raising funds to maintain and improve our lovely playing field. This year we plan to complete Phase One of our project! Thanks to your support we plan to complete the first phase of our plan, which is to improve and update the children’s play area. All being well, we hope you will be able to enjoy the newly finished playground at this year’s Fringe event. (Please see plans below). Many young families get a huge amount of enjoyment from the play area, so we are very pleased to be able to improve the space. Following the completion of Phase One, we have further plans in progress to rebuild a new club house and provide additional sporting facilities for the residents of Towersey and the surrounding areas. It is a Community Project, run and manned by volunteers from the village. Remember Dance All Day & Laugh All Night! 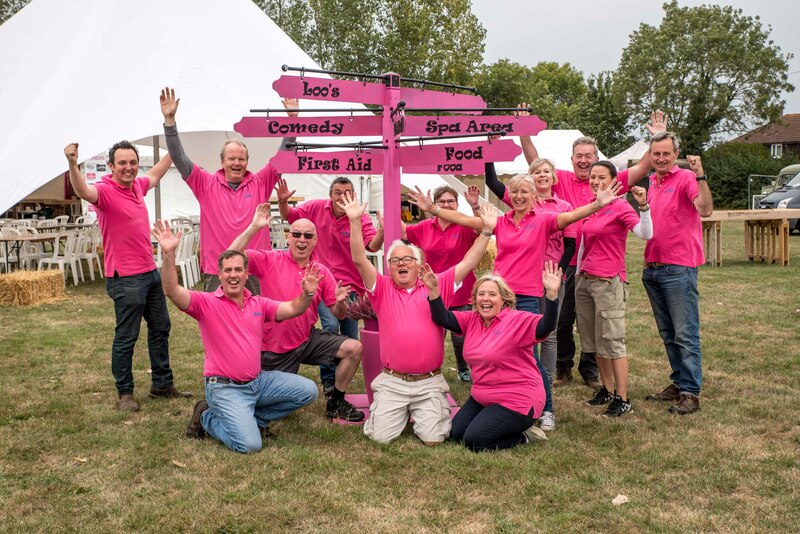 In 2015 a group of enthusiastic Towersey villagers decided to hold a fundraising event on the August Bank holiday weekend at Towersey Playing Fields. They settled on the idea of a comedy evening featuring some of the finest comedians on the circuit, with bands and beer during the afternoon, to compliment the music festival hosted in nearby Thame. This was how the “Towersey Fringe” was born. 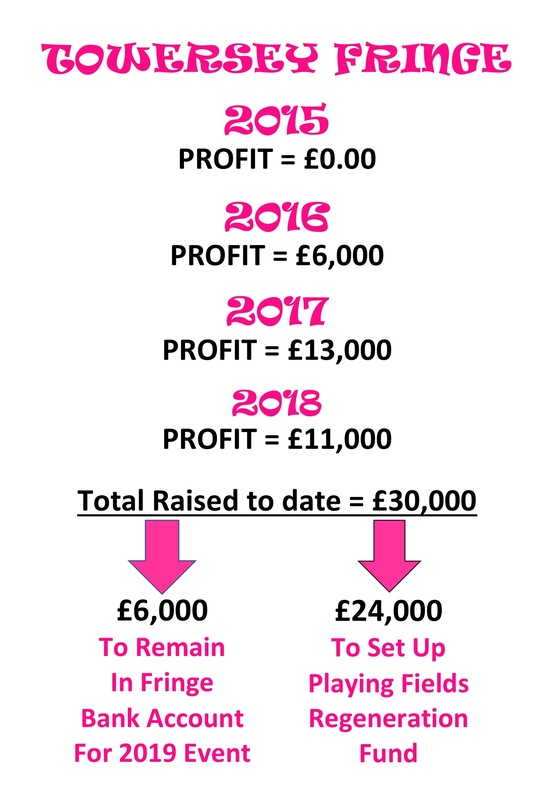 Everything is run by volunteers, bands provide their time for free and we look for as many sponsors as we can to help cover the costs involved. The aim of the Fringe is to raise money for Towersey Playing Fields which is badly in need of a new clubhouse, among other things, and with your help we will raise the money that is needed to provide it. Read some of the reviews that visitors have been kind enough to send us. Towersey Playing Fields have been held in trust for the benefit of Towersey residents and members of its wider community for over 50 years.The Parish Council are Custodian Trustees, but the day to day development and management of the facility is taken care of by a Management Committee which is a Registered Charity. The Playing Fields have always been financed by the community, with assistance from Oxfordshire Councils for specific large one off projects, and by donations from the Towersey Festival when funds permitted, and generous personal donations from individuals. The Charity receives no regular funding from the Parish Council, which is unusual for a facility of this size (over 7 acres), although they do assist when asked and when their funds permit. The community has raised funds through all sorts of innovative events over the years and the Committee continues to plan to increase income and control costs to ensure best value. It is increasingly unusual for a small community like Towersey to have retained such a wonderful site and facilities. On the edge of the village, on a slight rise, the fields look across the Vale of Aylesbury and towards the Phoenix trail. There is a large children’s play area which is very popular with families travelling some distance to use it. There is a well maintained cricket square, outfield and nets, room for at least two football pitches, floodlighting and a clubhouse. The present Management Committee recognise what an important asset the Playing Field is for Towersey and its neighbouring communities. Green playing fields are increasingly rare, as are sports facilities in general. People of all ages are engaging in sports to improve their physical and mental health, and to seek out new social groups. government and local funding being made available to such projects. This is your opportunity to get in at the ground floor and be part of a legacy that we can leave for future generations.